Endemic to southern Argentina and Chile where it mainly occurs in the Andes. Threats include fire, grazing and encroachment from commercial plantations of exotic species. Dioecious tree (rarely monecious) up to 50m tall; trunk to 2m in diameter; crown broadly pyramidal. 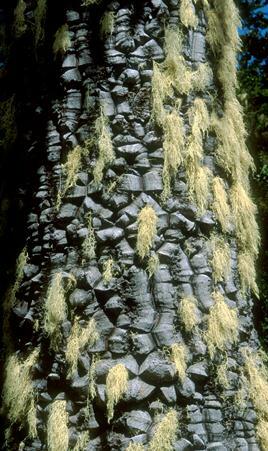 Bark grey, usually deeply fissured and forming hexagonal plates. Branches vertical, horizontal or swept downwards, often restricted to the upper part of tree. Leaves 2.5-3 x 1.5–2cm, ovate-lanceolate, base broad, apex sharply pointed, sessile, coriaceous, rigid. Male pollen-cones 8–12 x 4–5cm. Female seed-cones 15–20cm across, globose. Seeds 4-5 x 1.5cm, obconical-oblong or cuneiform, slightly compressed, with a large apical appendage, mid brown, 120–180 per cone; maturing from February to April (cones taking two years to mature). Native to south-central Chile and southwestern Argentina where it has a relatively limited distribution spanning three degrees of latitude from 37º20' to 40º20'S (Veblen et al. 1995). Its distribution is split between the main area straddling both sides of the Andes and two other disjunct small sub-populations in Cordillera de Nahuelbuta in Chile. The total area of occupancy in Argentina and Chile is 392.51km². Chile: It occurs from Region VIII (Province Biobío, 37º20’S) south to Region X (Province Valdivia, 40º20’S). In this area it has an actual AOO of 253.71km² (Echeverría 2004) with 97% of the population in the Andes. The small sub-populations in the coastal Cordillera de Nahuelbuta in Regions VIII and IX are between 37º40’S and 38º29’S and have an AOO of 74.35km² (Echeverría 2004). The northern coastal sub-population (37º44’S and 37º51’S) is predominantly in Parque Nacional Nahuelbuta and the smaller southern sub-population (38º26’S to 38º29’S) is located at Villa Las Araucarias. Argentina: It is restricted to the Province of Neuquén where it occurs between Lake Aluminé and Lago Lolog; it occurs continuously between 38º40'to 39º20'S, but disjunct stands can be found as far north as 37º50'S (Rechene 2000). It has an actual AOO of 138.80km² (Anonymous 2004). The main subpopulation is confined to the Andes, with most of the stands on the western slopes in Chile. In Argentina they are confined to a narrow strip about 200km in length; the most important forests are 30 to 50km wide and 150km long. The eastern-most stands occur as isolated groups (Burns 1993) which are probably remnants of an earlier, wider distribution. These fragmented stands show high levels of genetic variation (Bekessy et al., 2002, Marchelli et al., 2010) and these rear edge sub-populations are considered to be 'disproportionally important for the long-term conservation of genetic diversity' (Hampe & Petit 2005). The coastal cordillera of Chile has two small sub-populations, one mostly confined by Parque Nacional Nahuelbuta and the smaller southern, unprotected site of Villa Las Araucarias. This latter sub-population is also significantly genetically differentiated (Bekessey et al. 2002). In the Andes Araucaria occurs from the upper timber-line at ca. 1500 to 1800m, down to 900m with scattered individuals as low as 600m (Veblen 1995). The forests occur on soils derived from volcanic ash deposits (Casertano & Lombardi 1963) or on well-developed soils derived from metamorphic and sedimentary rocks (Peralta 1980). It can form relatively extensive pure stands often on steep volcanic slopes or in association with temperate rainforest species including Nothofagus antarctica, N. dombeyi, N. pumilio and Saxegothaea conspicua (Hechenleitner et al. 2005), however its most common forest type in the Andes is over a sub-canopy of Nothofagus pumilio (Veblen 1982). In the northern sub-population in the Nahuelbuta Cordillera (southern central Chile) the species occurs at its highest coastal altitude of 1400m and grows with N. obliqua and N. pumilio while the southern sub-population occurs at an altitude of 600m in a highly disturbed landscape dominated by mixed forests of Nothofagus spp. and exotic tree species (Hechenleitner et al. 2005). In Argentina it forms pure stands at between 900 and 1800m (Rechene 2000), but it is commonly associated with Nothofagus antarctica or N. pumilio (Funes, 2006), in Parque Nacional Lanin 49% of the forest is associated with Nothofagus pumilio and N. dombeyi. Towards the east of its range in Argentina where the rainfall is less (between 1000 to 1500mm) it occurs with Austrocedrus chilensis, Lomatia hirsuta and shrubby species of the steppe vegetation (Burns 1993). Its ecology is disturbance-driven, mainly by the effect of volcanoes, fire, landslides, snow avalanches and wind. In order to survive such disturbances it has developed effective adaptations, such as thick bark and epicormic buds (Burns 1993; Veblen 1982). 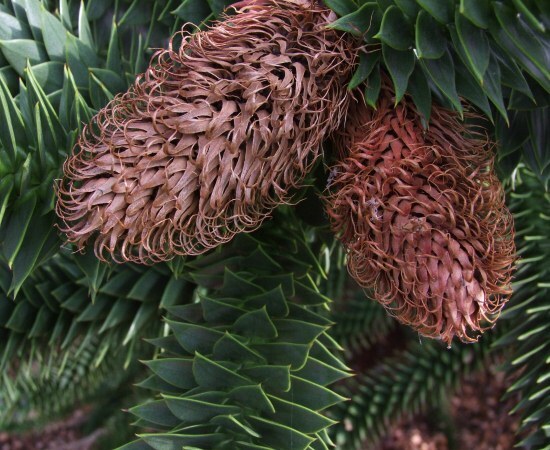 Araucaria araucana is predominantly dioecious and its seed is gravity-dispersed or assisted by Austral parakeets (Enicognathus ferrugineus) and other animals (Shepherd et al. 2008). Both seed and pollen are relatively heavy and may not disperse over large distances, although seed dispersal may be assisted by parakeets and other animals (Finckh & Paulsch 1995). Asexual reproduction by root suckering has been reported (Schilling & Donoso 1976), but it is unknown how important this process is to population maintenance and expansion (Veblen et al. 1995). It is a long-lived tree and specimens over 1300 years are not uncommon. Araucaria araucana has light, soft, medium-weight wood which is used for lumber, flooring, paper pulp and ship-masts (Delmastro & Donoso 1983). Due to its listing on Appendix I of CITES there is no legal international trade in the timber; currently there is only local use in Argentina and Chile. The seeds are very rich in carbohydrates and proteins and were once an essential part of the diet of the indigenous people; the seeds are boiled or roasted, and their taste is similar to that of chestnuts. Today, the seeds are still eaten by local inhabitants, both the indigenous people and settlers. It is also highly prized as an ornamental tree in Europe (especially throughout Great Britain) and in parts of North America. Araucaria araucana has an actual AOO of 392.51km² which falls within the threshold of 500km² for Endangered under B2. Within the Andes and the Coastal Cordillera of Chile it is severely fragmented and there is a continuing decline in its AOO and EOO due to a range of debilitating factors including fire, logging and overgrazing. About 60% of the Argentine Araucaria forests remain after deforestation (Veblen et al., 1999; Rechene 2000) and these forests are under continual threat and degredation, historically this has been caused by fire, logging and overgrazing. The frequency of fires has increased during the 20th century in order to establish agricultural and livestock activities (Marchelli 2010) and this has resulted in severe fragmentation of Araucaria forests. Today the most obvious sign of forest degradation is the lack of natural regeneration that, under normal conditions, follows a ‘pulse’ pattern of highly productive seed years followed by less productive ones (Gallo, 2004). Many forests are subject to intensive human use in the form of seed collecting and animal grazing, Araucaria trees are poor at regenerating, and any regeneration that does occur is principally asexual with trees sprouting from roots (Gallo 2004). There are severe threats in the north of its range in Argentina, due to the establishment of plantations of exotic tree species within those stands (A.C. Premoli pers. com.). Araucaria araucana is listed on Appendix I of CITES which strictly regulates the trade in its timber and seeds. The listing was approved in Chile in 1979 and it transferred from Appendix II to Appendix I in Argentina in 2000 (Anon, 2000). It is listed as a Natural Monument in Chile which gives it legal protection against logging. Approximately, 65.9% of the forests in the Coastal Range are within private properties, and the State (SNASPE) protects only 34.1% (Echeverría, 2004). The subpopulation in Villas Las Araucarias, which has unique genetic characteristics, is currently unprotected by the State (Bekessy et al. 2002, Echeverría et al. 2004 ). There are several Chilean private initiatives which are helping to protect Araucaria forests and these include Parques Para Chile and Reserva Nasampulli. In Argentina most stands have some form of protection, especially in Parque Nacional Lanín and Nahuel-Huapi. However, small and fragmented stands towards the eastern range in Argentina which are as genetically diverse as those on the Andes, occur outside protected areas and deserve particular attention (Marchelli et al. 2009). 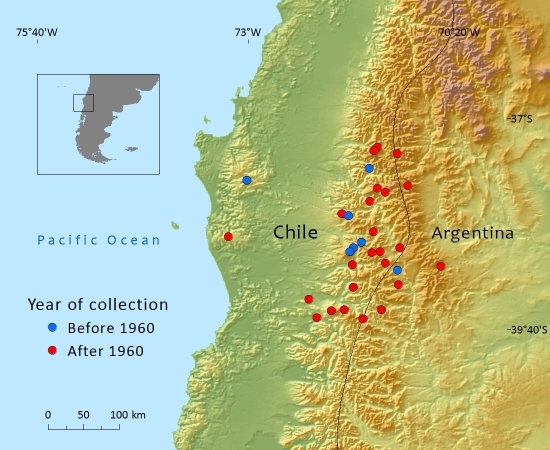 The Chile Villa Las Araucarias forest restoration project is restoring a severely degraded 4 hectare site (Echeverría et al. 2004). Aagesen, D.L. (1998). 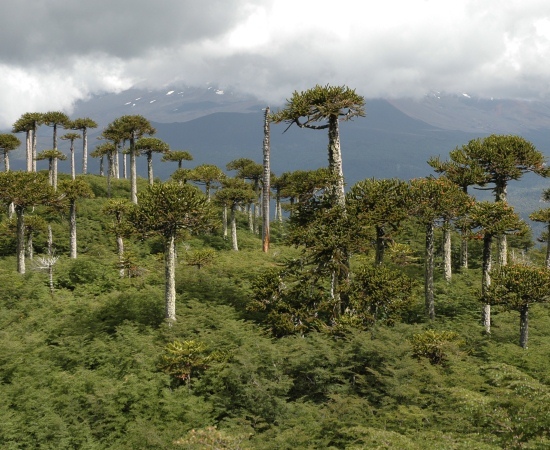 Indigenous rights and conservation of the monkey puzzle tree (Araucaria araucana Araucariaceae): a case study from Southern Chile). Economic Botany 52(2): 146-160. Aagesen, D.L. (1998). 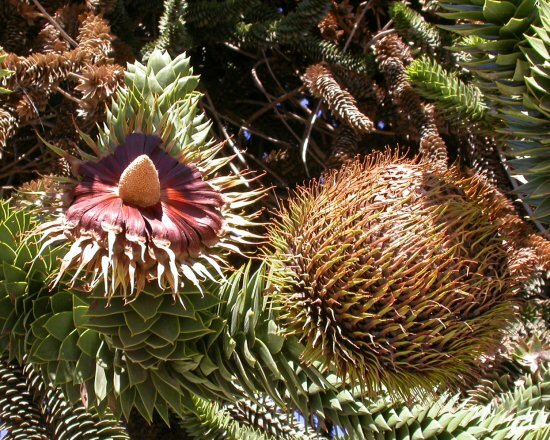 On the northern fringe of the South American temperate forest: The history and conservation of the monkey-puzzle tree. Environmental History 3(1): 64– 85. Anonymous. (2000). Proposal to Transfer from Appendix II to Appendix I of the Argentine population of monkey puzzle tree (Araucaria araucana), in accordance with the criteria specified in Resolution Conf. 9.2. 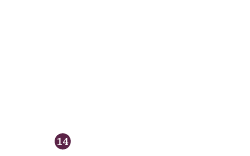 Proposal 11.55 of the Eleventh Conference of the Parties. Gigiri (Kenya), 10-20 April 2000. 4 pp. Available at: http://www.cites.org/eng/cop/11/prop/55.pdf. Bekessy, S.A., Sleep, D., Stott, A., Menuccini, M., Thomas P., Ennos, R.A., Burgman M.A., Gardner, M.F. & A. C. Newton. (2002). 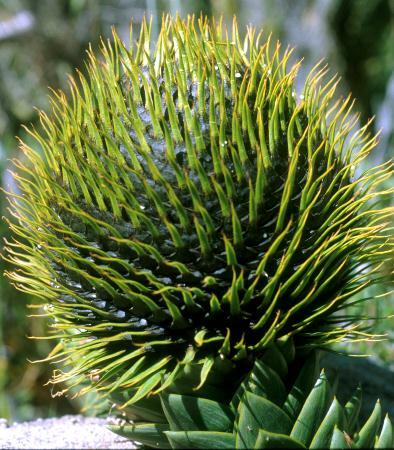 Adaptation of Monkey Puzzle to Arid Environments Reflected by Regional Differences in Stable Carbon Isotope Ratio and Allocation to Root Biomass. Forest Genetics 9(1): 63-70. Bekessy, S, Lara, A, Gonzalez, M, Cortez, M, Gallo, L, Premoli, A and Newton, A (eds). (2004). Variación en Araucaria araucana. In: C. Donoso, A. Premoli, L. Gallo & R. Ipinza (eds), Variación Intraespecífica en las especies arbóreas de los bosques templados de Chile y Argentina, pp. 215-231. Editorial Universitaria. Bekessy, S.A., Sleep, D., Stott, A., Menuccini, M., Thomas P., Ennos, R.A., Burgman M.A., Gardner, M.F. & Newton, A.C. (2002). Adaptation of Monkey Puzzle to Arid Environments Reflected by Regional Differences in Stable Carbon Isotope Ratio and Allocation to Root Biomass. Forest Genetics 9(1): 63-70. Burns, B.R. (1993). Fire induced dynamics of Araucaria araucana - Nothofagus antarctica forest in the southern Andes. Journal of Biogeography 20: 669-685. CONAF, CONAMA, BIRF, Universidad Austral de Chile, Pontificia Universidad Católica de Chile, Universidad Católica de Temuco. (1999). Catastro y evaluatión de los Recursos Vegetacionales Nativos de Chile. Informe Nacional con Variables Ambientales. Santiago, Chile. Dodd, Z.A. and R.S. Dodd. (1998). Genetic diversity among coastal and Andean natural populations of Araucaria araucana (Molina) Koch. Biochemical Systematics & Ecology 26(4): 441-451. Echeverría, C., C. Zamorano & Cortés M. (2004). Conservation and restoration of Monkey Puzzle (Araucaria araucana) forests in Chile (Final Report). Finckh, M. and Paulsch, A. (1995). The ecological strategy of Araucaria araucana. Flora 190(365-382). Gallo, L., F. Izquierdo, L.J. Sanguinetti, A. Pinna, G. Siffredi, J. Ayesa, C. Lopez, A. Pelliza, N. Strizler, M. Gonzales Peñalba, L. Maresca & L. Chauchard. (2004). Araucaria araucana forest genetic resources in Argentina. In: Vinceti, B., W. Amaral and B. Meilleur (eds), Challenges in managing forest genetic resource for livelihoods: examples from Argentina and Brazil., pp. 105-131. International Plant Genetic Resources Institute, Rome. González, M.E., Veblen, T.T. & Sibold, S.(2005). Fire history of Araucaria -Nothofagus forests in Villarrica National Park, Chile. Journal of Biogeography 32: 1-15. Hampe, A. and Petit, R.J. (2005). Conserving biodiversity under climate change: the rear edge matters. Ecology Letters 8: 461-467. Hechenleitner, P., Gardner, M.F., Thomas, P.I., Echeverría, C., Escobar, B., Brownless, P. & Martínez, C. (2005). Plantas amenazadas del Centro-Sur de Chile. Distribución, Conservación y Propagación. Universidad Austral de Chile y Real Jardín Botánico de Edimburgo, Santiago. Marchelli, P. C. Baier, C. Mengel, B. Ziegenhagen & L. A. Gallo. (2010). Biogeographic history of the threatened species Araucaria araucana (Molina) K. Koch and implications for conservation: a case study with organelle DNA markers. Genetic conservation 11(3): 951-963. Peralta, M. (1980). Geomorfología, clima y suelos del tipo forestal Araucaria en Lonquimay. Facultad de Ciencias Forestales, Universidad de Chile, Santiago. Rafii, Z.A. & Dodd, R.S. (1998). Genetic diversity among coastal and Andean natural populations of Araucaria araucana (Molina), K. Koch. Biochemical Systematic Ecology 26: 441-451. Schilling, R & Donoso, C. (1976). Reproduccion vegetativa natural de Araucaria araucana (Mol.) Koch. Investigaciones Agricultura (Chile), 2: 121-122. Veblen, T.T. (1982). Regeneration patterns in Araucaria araucana forests in Chile. Journal of Biogeography 9: 11-28. Veblen, T.T., Burns, B.R., Kitzberger, T., Lara, A. and Villalba, A. (1995). The Ecology of the Conifers of Southern South America. In: N.J. Enright and R.S. Hill (eds), Ecology of the Southern Conifers, pp. 129-135. Melbourne University Press, Carlton, Victoria. M.F.Gardner, 2016. Araucaria araucana, from the website, Threatened Conifers of The World (http://threatenedconifers.rbge.org.uk/taxa/details/783).